It is heard loud and clear ! Death knell for routine stenting for renal artery stenosis ! For medical science to defy logic , is a not a great new discovery . “Diabetes is a major risk factor for heart disease but controlling diabetes may not remove this risk factor” Similarly severe mulitvessel CAD occurs without any symptoms and compromise on LV function . It is a natural human instinct to open of any thing that is obstructing on their path . The same logic applies in physicians when we encounter blocks in the vascular highways . For a moment compare it with an express way . We realise many roads have a reserve capacity . Even if the road is half blocked , traffic congestion rarely happens as the original road’s width is sufficiently large for the projected traffic . Some other roads have emergency service lanes (Collaterals) that can take care the flow of traffic. Another question to ask is , Where does the road lead to ? and why we are traveling ? This is what happened in the lase decade . Interventional radiologists , vascularologists , cardiologists started opening renal artery obstructions , at their whims and fancies, in many elderly and middle-aged population .To their surprise (This surprise is due to ignorance ) they found no worthwhile benefit either in the BP reduction or worsening renal function . * Renal interventions are notorious for many complications , which is often not reported . Read this article to know it better. Common sense can work great wonders than the much hyped RCTs . (Except ASTRAL of course !) In this era of scarcity of such sense we can expect another study soon , to nullify ASTRAL and give us further license to pursuit the good old human instinct ! Already silent noises are made in interventional corridors questioning the outcome of ASTRAL. 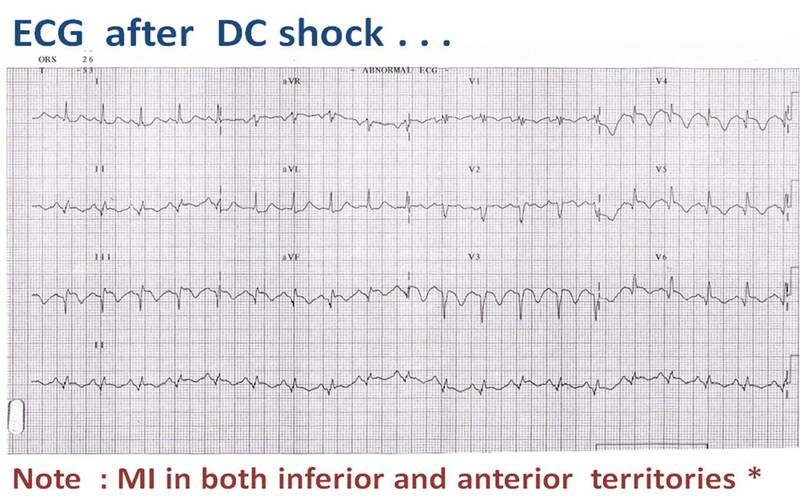 How common it is , for an “Acute STEMI” to present with stable ventricular tachycardia ? It is strongly believed VF cannot occur without a brief episode of VT preceding it .Logic would also suggest the ischemic myocardium can not suddenly become chaotic “with the first beat “. There is little documentation available to unprove this presumption. In spite of this intimate relationship between VT and STEMI , it is very rare for a STEMI patient to enter ER with a sustained stable ventricular tachycardia . While many VTs are known for it is hemodyanmic stability and immunity against degeneration into VF , it is extremely rare for VT to remain as VT in acute STEMI. 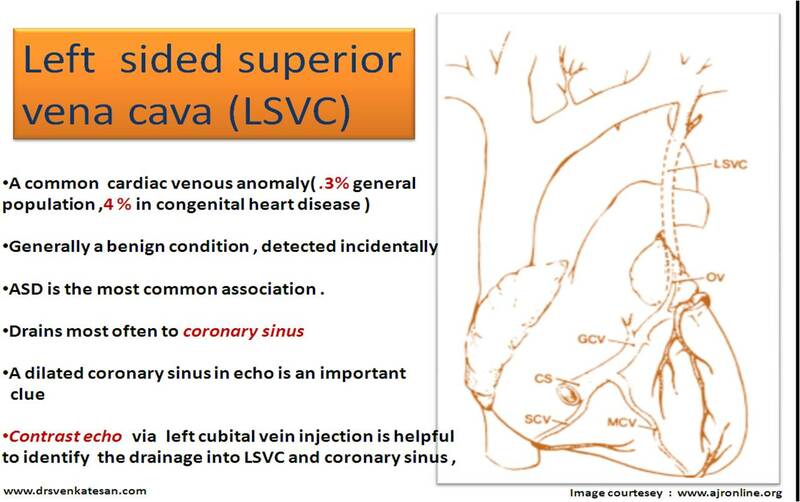 *Note : NSVT can be common in hospitalised patient in the coronary care unit . In our experience a sustained VT in STEMI will enter the VF mode within 60 seconds .If not , it is a highly unusual phenomenon . 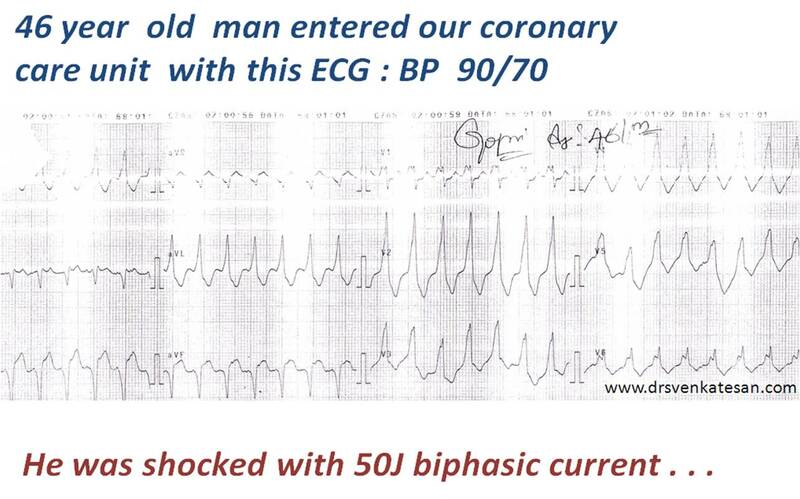 Here is case report, a patient walked into coronary care unit with sustained( relatively stable) VT with LBBB morphology .We thought it was a non- ischemic VT (cardiomyopathy , RVOT etc) .As we were examining him, he became unstable and was shocked 50 J biphasic .To our surprise a classical STEMI was unmasked and he was immediately thrombolysed. * It is possible , the patient had suffered a old MI which got infarcted again and the VT was scar mediated . Nearly all episodes of ventricular tachycardia , that occur in the early minutes/ hours of STEMI would degenerate into VF.This includes VTs that occur within the CCU . Most of the times , the CCU physicians and staffs revert this VT promptly and deny the ventricles from performing the dance of death ! It is extremely rare for an acute ischemic VT associated with STEMI to walk in to the hospital, which our patient did ! What determines a VT to degenerate into VF ? 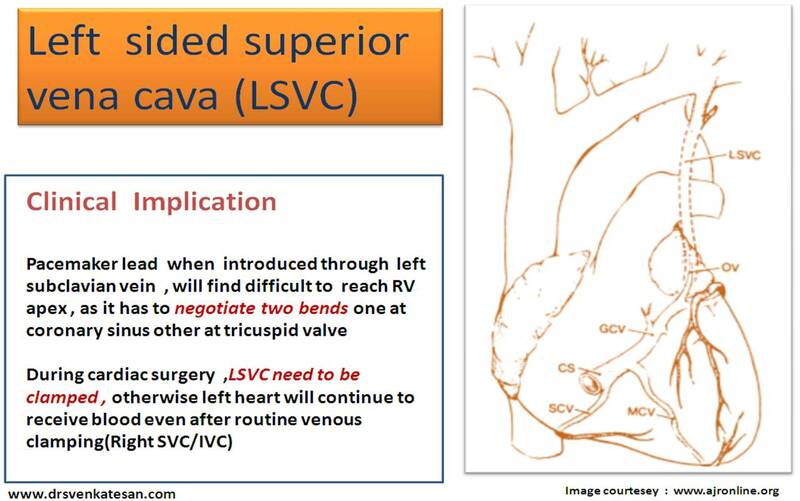 We have read extensively about LV pressure volume loops . What about Left atrial pressure volume relationship ? This could be vitally important to understand left atrial failure . While, it is often taught that , LA comes to the rescue of left ventricle at time of stress , we rarely talk about left atrial failure ! Where will the LA look for help when it is stressed ? The importance of left atrium as a mechanical chamber is well recognised .It is supposed to empty the blood it receives from pulmonary veins within a narrow pressure zone of 8-12mmhg within a fraction of a second. Even a slight increase in LA pressure may result in pulmonary venous regurgitation and the incoming venous tides are reversed(“a” reversal in pulmonary vein echo ) that results in the so called pulmonary congestion /Pulmonary venous hypertension. If only god has created additional pulmonary venous valves** at it’s entry , LA can perhaps a relax a little bit . But it is not the case . So, LA function becomes as vital as LV. Here is an article from European heart journal , which gives great insight into Left atrial function. The one that has fascinated me is the LA pressure volume loop. Fluid retention is a classical sign of cardiac failure . (Elevated JVP, hepatomegaly , edema legs ) The mechanism of fluid retention are many .But, traditionally we have given importance to venous back pressure (Hydrostatic pressure) . Equally important (if not more !) is the renal sodium and fluid conservation in response to reduced effective renal blood flow. How common is ascites in cardiac failure ? While we see hydrothorax little more frequently it is rare to get ascites in cardiac failure .However ascites often manifests late in the pre terminal phase of cardiac failure *. This is due to congestive hepatomegaly, secondary hyperaldosteronism and renal dysfunction . When does ascites come early before edema of extremities in cardiac failure ? It is classically reported in constrictive pericarditis. The reason why ascites precedes edema legs is long been speculative . Now we have evidence , the pericardial pathology , has a direct effect on the hepatic venous morphology. 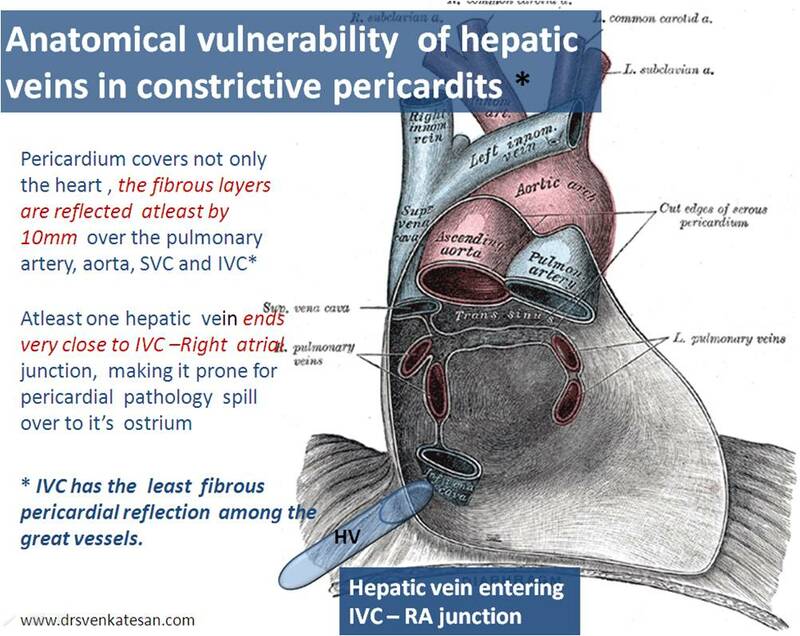 There can be a selective , partial constrictor effect on at least one of the hepatic vein as it enters the right atrium .In fact , the entry point of hepatic vein is delicately close to IVC/RA junction. *It should be remembered in the current era we are expected to diagnose cardiac failure even before the onset of edema ! Anatomical constriction has a mechanical effect on the hepatic venous drainage and subsequently alters the hepatic function . Segmental hepatic dysfunction is thought to ooze out the ascitic fluid from the surface of liver .Ultimately severe raise of hepatic venous pressure results in congestive hepatomegaly and could result in now obsolete , cardiac cirrhosis. Is ascites precox an exclusive feature of constrictive pericarditis ? Not necessarily so . Even though , it was first described in this condition ,clinical experience suggest, any congestive cardiac failure with predominate right sided pathology like organic tricuspid valve stenosis or regurgitation, right ventricular endomyocardial fibrosis , all can result in significant ascites which may precede edema legs. What is effect of of severe TR on hepatic venous hydrodynamics ? which may contribute to early ascites in organic tricuspid valve disease. Why the qrs complex becomes wide and tall in LBBB ? The qrs complex is wide , due to delayed conduction over non specialized fibres .The qrs becomes are tall due to temporal dissociation of RV and LV forces , which leaves the LV forces unopposed , thus a tall qrs is inscribed , without the neutralizing effect of RV forces. Is muscle to muscle conduction a hall mark of LBBB ? specialized conduction system . It depends upon the level of block of LBBB. What is the mechanism and clinical significance of left axis deviation in isolated LBBB? What is the impact of IVS contraction and timing in LBBB ? Why does the abnormal septal motion in LBBB , do not desynchronize the normal LV ? Most isolated chronic LBBBs do not confer any hemodynamic disadvantage to LV – why ? LBBBs are dangerous looking ECG , but in most patients it is benign , in the absence 0f structural heart disease like valvular , myocardial or ischemic disease. Yes . Though we expect the reversal of septal depolarization extinguish the initial r in v1 to v3 .It is noted in many. 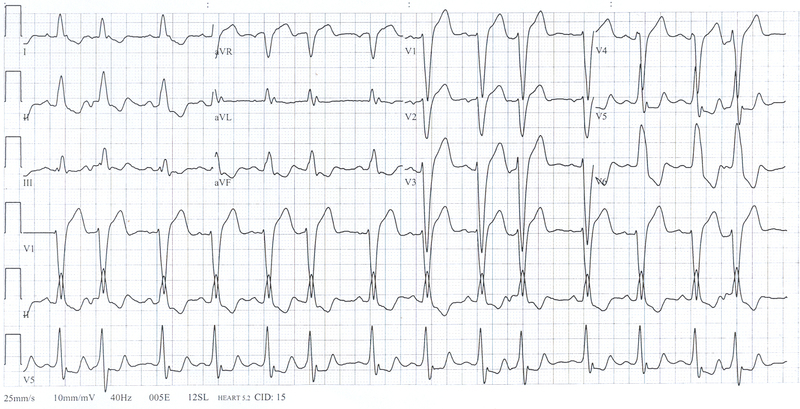 Hence presence of small r in v1 to v3 does not rule out LBBB. How do we explain concordant pattern of QRS v1 to v6 in LBBB ? We expect the qrs to transit from QS complex to RS , at-least by lead v5/v6 .Some times even V6 shows a RS complex.This is usually due to faulty lead position or a grossly enlarged LV, ie if we record V 7 or V8 we will be able to pick up the qs complex. What will be the morphology of a VPD that is arising from LV in the presence of LBBB ? A premature beat arising from a ventricle which is having a bundle block is sort of electrical blessing !The VPD often bye passes the block and makes the conduction near normal and a normal qrs may be recorded. So , when a patient with LBBB suddenly develops a normal qrs beat or normal qrs tachycardia one should consider a VT arising from the Left ventricle . And a studious electro physiology fellow should be able to answer the following ! What will be the morphology of VPD if it arises from RV and septum in the presence of LBBB ? What is the effect of LBBB on S1 and S 2 ? You are supposed to hear 4 components in complete LBBB ! In reality this does not happen . At best you can hear the reversed split of S2 with difficulty . beta blockers , calcium blockers etc are administered ? Common sense would say yes. Scientific sense has no answer . Tetrology of Fallot is the commonest cyanotic heart disease . In 1973 , working at Portland, Oregon , Bonchek and colleagues created this classic with intense clinical acumen , that defined the way how we understood TOF in infancy . Such studies have become extinct in this fast paced cardiology academia ! With due tributes , here is a slightly modified version of Bonchek classification of TOF in infancy . Every cardiologist must read every line of this article which came 37 years ago !